The Duterte administration’s close ties with Beijing has always been apparent, but what has remained a question is the full extent of their closeness. Recent revelations might have revealed that the Chinese Government may have a link directly to the Philippines’ head-of-state himself. 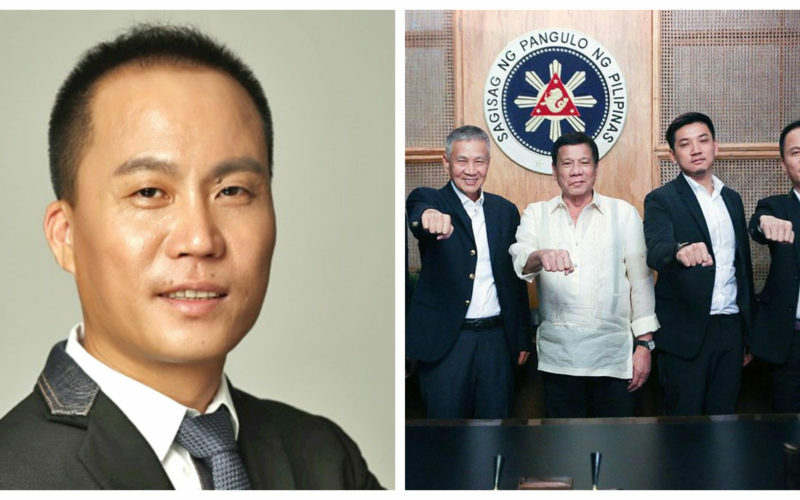 Michael Yang, a Chinese businessman who has close links with dignitaries from the People’s Republic of China (PRC), was confirmed to hold the role of “Presidential Economic Adviser” to President Duterte. While sounding important, the role is reminiscent of those “token positions” handed out to campaign donors for elected politicians to “repay their debts” – all for self-promotion and wielding no real powers at all. Presidential Economic Adviser and businessman Michael Yang. What raises a red flag however, is that Yang is neither a Filipino citizen but also has been linked to the illegal drug trade in the past. Not to mention, he is known to have close ties with PRC officials at a time when tensions in the West Philippine Sea is reaching its tipping point. A slip of the tongue by Duterte? Yang had stayed under the radar of mainstream media, but was thrust into the spotlight when he was mentioned in a speech by President Duterte himself. 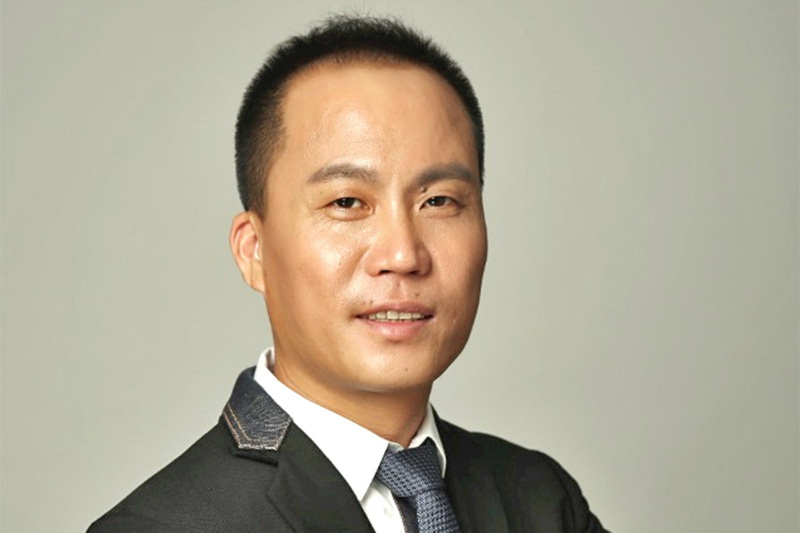 The latter made a curious statement saying that allegations regarding Yang’s involvement in the drug trade were false, despite no news report making any accusation of that sort beforehand. Duterte and Yang had known each other even before the former’s ascension into the presidency, as the latter is a prominent businessman in Davao City. He owns a chain of shopping outlets, and the President also mentioned that he is involved in money lending in the city also. The office of Michael Yang in the Philippines, dedicated to his supposedly-symbolic role as Presidential Economic Adviser. What is interesting is that Duterte himself repeatedly denied that Yang held such position, even with the news reports and photo. “Cannot be, because he is a Chinese,” was his reply when asked if the businessman held such role in his administration. Photocopied copies of Yang’s contracts were also published online by Rappler.com, retrieved through the Freedom of Information Act, which shows that the Office of the President entered into two contracts with the Chinese businessman for “technical services”. One document showed Yang was “contracted as Economic Adviser to the President for the period January 1, 2018 to June 30, 2018,” while the other bind him to the same role “from July 1, 2018 to December 31, 2018”. 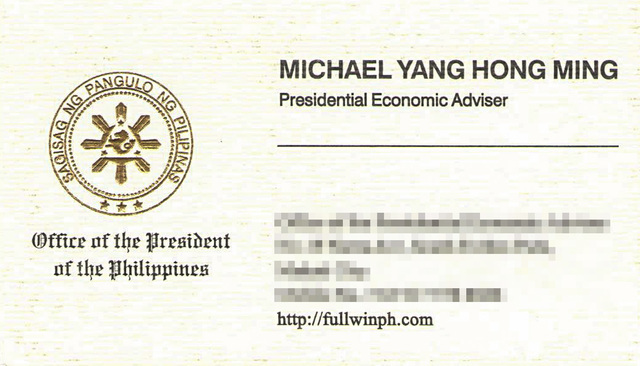 Not only did it confirm that Yang is indeed a “Presidential Economic Adviser”, he also had his mandate renewed by Duterte’s office itself. It would be impossible for President Duterte not to know of this arrangement himself. This allegation was finally confirmed by the President’s office through his Official Spokesperson, Salvador Panelo. The latter even revealed that it was Duterte himself who appointed Yang as an economic adviser, exposing him to have lied when asked about it previously. As a caveat, Panelo explained that it was not Duterte who signed Yang’s contracts but instead two other Cabinet secretaries. That still does not hide the fact that the President shoulder-tapped him for the role, and therefore had to have known of his role. When Duterte first made light of Yang, he was denying the latter’s links to the drug trade. The President said these allegations were “impossible” because the businessman had very close ties with Chinese dignitaries, including Chinese ambassador to the Philippines Zhao Jianhua and Chinese Premier Li Keqiang. Duterte boasted that Yang accommodates the Chinese ambassador in his private residence, showing their closeness. 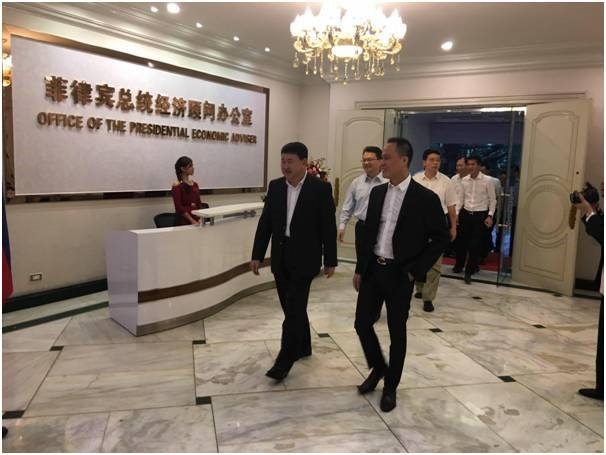 He also disclosed that Yang was once a part of Premier Keqiang’s entourage during the latter’s foreign visits. Having an individual with that level of closeness with a foreign nation to make economic decisions for the Philippines is on the verge of allowing foreign interference. What exactly is Yang’s relationship with the PRC, and is it safe to allow him access to sensitive information on our economy? Is Yang really part of the drug trade? Even ignoring Yang’s links with the PRC government, it is still concerning that he has been mentioned as being part of the drug trade. More recently, former police intelligence officer Eduardo Acierto came forward to reveal the businessman’s role in the country’ drug trade, and that his reports were repeatedly ignored by his superiors. For someone who repeatedly emphasizes his seriousness in eradicating illegal drugs in the country, President Duterte does not seem to have a problem having an individual who has been linked to the drug trade as part of his inner circle. It also begs to be asked why the President felt the need to lie about Yang’s involvement in his administration in the first place, does he have anything to hide with regards to their arrangements? It is obviously unfair to reprimand Yang based on unfounded allegations, but the businessman has not been subjected to any investigation since the allegations by Acierto were made. For the sake of transparency, a virtue he claims his administration cherishes, the President needs to put his confidant under the microscope and carefully scrutinize his activities.